If you are looking to purchase some of my books on transitions through life’s many different phases they can be found on amazon.com. 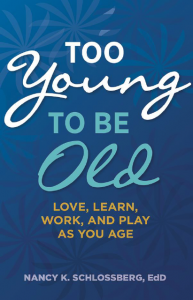 Too Young To Be Old: Love, Learn, Work, and Play as You Age (Paperback) 2017: Order Now! As the Baby Boomer generation reaches retirement age, the number of Americans ages 55 and older is growing dramatically. The question on our minds is: How do I age well? In this accessible and upbeat book, Nancy K. Schlossberg builds on the concepts she pioneered in her smash hits Retire Smart, Retire Happy and Revitalizing Retirement with an engaging take on positive aging. There has been a shift in how we think about aging. Beginning with the basic issues—health, finances, and relationships—readers will learn to think about and develop a deliberate plan to navigate transitions and age happily. Your talk yesterday was Great! I had some down-time at a doctor’s office today, and started reading your book. I can tell it won’t take me long to finish. Thank you so much for writing it. I was so energized by what I read that I walked home from the doctor’s office instead of taking a cab. And the walk was about 5 miles! Nancy Schlossberg is a prolific writer, especially on the topic of living well as we age. Her most recent book is a swift and satisfying read, full of wisdom and encouragement for all of us. She addresses the evil of ageism and how to deal with it, especially as it affects one’s self-image. A discussion of transitioning – of the challenge of moving, health changes, family formations – is especially engaging. Stories of how various individuals both cope with and thrive with aging enrich the text, and bring the more abstract ideas down to earth. At the end of each section, she assigns a “To-Do List” to encourage action as well as understanding. The book concludes with the idea of re-creating the self, with a focus on family, fun, romance, and self-satisfaction. 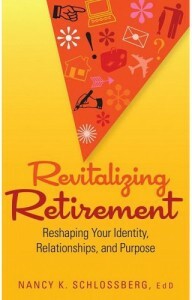 Revitalizing Retirement: Reshaping Your Identity, Relationships, and Purpose (Paperback) 2009: Order Now! In preparation for retirement, we are often urged to build up our financial portfolio or perhaps down-size our home or move closer to family. 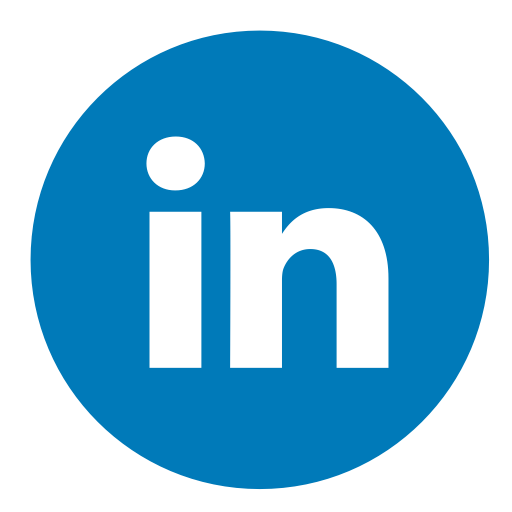 Often neglected in this process, however, are the psychological ramifications that come with the transition into retirement. It is important for retirees to make a financial plan for their retirement, but also to take stock of their psychological portfolio at the same time. This means taking an honest look at how your sense of identity will change with retirement, how your relationships and support systems may change, and how your sense of purpose will be affected. Revitalizing Retirement gives unique guidance on how to create a happy, fulfilling retirement. Nancy K. Schlossberg, a counseling psychologist and author of Retire Smart, Retire Happy, describes the secret to a happy retirement. She encourages readers to reshape their identity, relationships, and purpose. She discusses several coping skills that deal with accepting change and help retirees continue to feel that they are vital members of their community and that they matter. Each chapter contains stories from actual retirees that demonstrate the numerous ways of pursuing an enjoyable retirement. There are short quizzes and discussion questions at the end of each chapter so that readers can reflect on what they have read and see exactly how it relates to their own lives. This book is a must-read for anyone considering retirement in the near future as well as current retirees who may be struggling to find happiness in their daily lives. Most of us look forward to our retirement from full-time work, eagerly anticipating more free time and opportunities to play. But the reality of retirement can be very different. Relationships with family and friends may change and unexpected challenges may present themselves, leading us to wonder who we really are and what we can reasonably expect to accomplish in the remaining years of our lives. 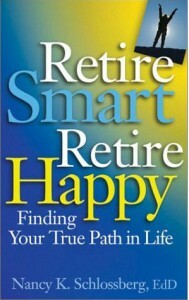 This is one of the first books to provide guidance on the psychological and emotional adjustments we make in retirement. Nancy Schlossberg, a psychologist and experienced counselor, provides tips on coping with its ups and downs and reassures us that retirement can be one of the most fulfilling times of one’s life. 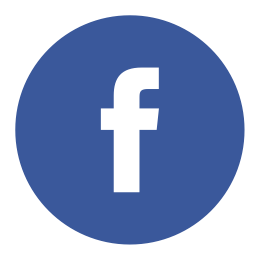 Readers are introduced to some common personality types among retirees, including Continuers, Adventurers, Searchers, Retreaters, and Easy Gliders. Armed with this knowledge, the author shows us how understanding our retirement “type” can help us put our strengths and resources to work. Each of the seven chapters contains dozens of examples of situations experienced by actual retirees and includes short self-assessment quizzes. You’ll learn how to conduct a personal inventory, reinforce relationships, investigate new roles and activities, and take charge of the future. Endorsements for Retire Smart, Retire Happy: Gail Sheehy, journalist and author – “Finally, a book to help people turn the inevitable traqnsition of retirement into another opportunity for growth and adventure.” Helen Thomas, Columnist, Hearst Newspapers, former White House Correspondent for United Press International – “Retire Smart, Retire Happy is a wonderful book–it is reality about retirement with the bark off. Those who think they will live happily ever after when they leave their jobs may be disappointed. But the author shows many have found a way to fulfill their lives afterward.” George Kourpias, President, Alliance for Retired Americans, AFL-CIO – “This book is a roadmap to a successful retirement. It is a must read. 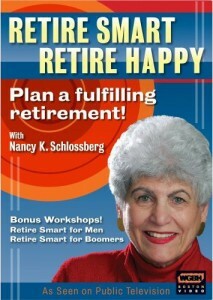 Retire Smart, Retire Happy with Dr. Nancy K. Schlossberg 2008 PBS special on DVD: Order Now! Are You Ready for Retirement? The traditional retirement age is 65, and today, nearly 6,000 Americans hit that milestone each day. As baby boomers age, that figure will jump to 9,000 per day. Are you getting ready to retire, know someone who is retired, or are you struggling with retirement yourself? Retirement is not just about money–a healthy psychological portfolio is vital for this major life transition. Author and counseling psychologist Nancy K. Schlossberg shows us how to prepare for a successful and fulfilling retirement, addressing the common problems and emotional challenges that can occur, such as loss of purpose, loss of identity and changing intimate relationships. Discover how your strengths and resources can lead you down many different paths. Are you an Adventurer? Easy Glider? Searcher? Retreater? 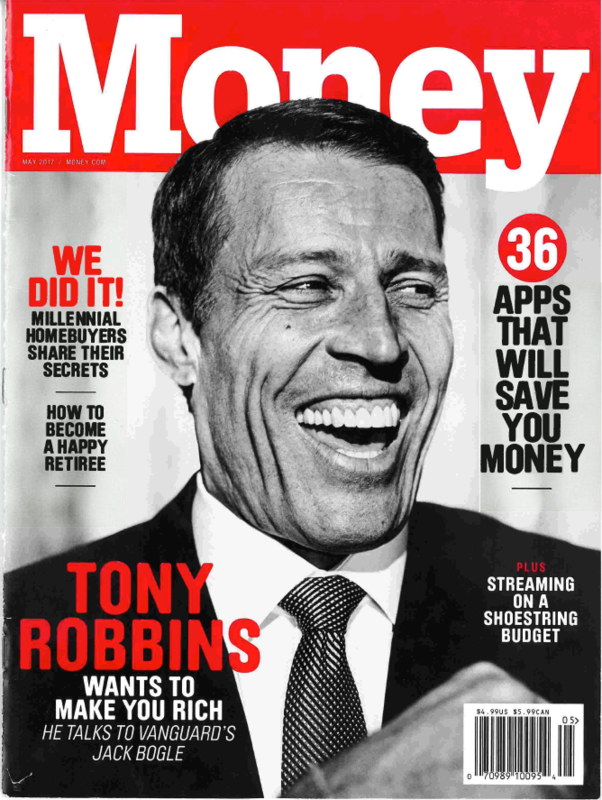 Learn how to make retirement the best time of your life! Dr. Nancy K. Schlossberg specializes in better mid-life, aging, transition and coping. A retired college professor, she has made a successful transition to lecturer and author of eight books on life transitions, including her latest, Retire Smart, Retire Happy. 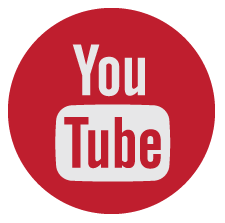 DVD Special Features Include: Two Bonus Video Workshops: Retirement for Men and Retirement for Baby Boomers; and a Q&A session with Nancy. 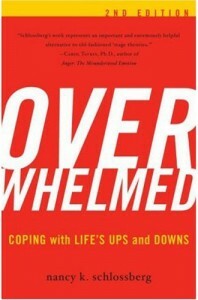 Overwhelmed, 2nd Edition: Coping with Life’s Ups and Downs (Paperback) 2007: Order Now! Based on years of research, this book examines significant life transitions-families moving, loss of a job, retirement-and offers a step-by-step approach to turning these often overwhelming events into challenging experiences. By systematically sizing up transitions and one’s resources for dealing with them, people can learn how to build on their strengths, cut their losses, and even grow in the process. Schlossberg’s work on transitions provides a generic framework to dealing with any transition and is written in accessible, everyday language. The only textbook explicitly designed to address counseling with adults who are coping with individual, relationship, and work transitions, this volume integrates the basic tenets of adult development with therapeutic practice. 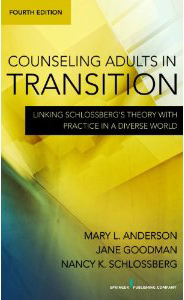 It is based on Schlossberg’s theory of transitions, a new process and content model that offers effective techniques for helping adults to understand and successfully navigate normal life transitions.This revised edition addresses contemporary societal ills that exacerbate adult life transitions, such as a tumultuous economy, increased unemployment, bankruptcies, and foreclosures, and focuses on our increasing racial and cultural diversity. The volume also expands its consideration of spiritual and social justice issues and provides a more integrated and holistic approach to adult transitional counseling. 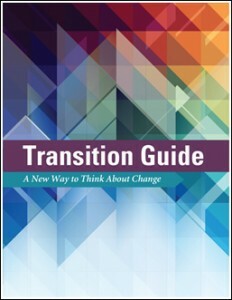 Transition Guide – A New Way To Think About Change: Order Now! Developed by experts on coping strategies, this is a no-nonsense, action-oriented approach to mastering change. It will enable you or your clients to take charge of the change, see it in a new light and most importantly, move forward instead of looking back. The Transition Guide is an instrument specifically designed for those who face change in their career, their relationships, and other aspects of their life.